Solitaire isn't just a card game! In this project, you'll make a board game for one player, called board solitaire or peg solitaire. The triangle-shaped board in this project is designed for marble playing pieces, but can also be made as a simple "print, cut, and play" game board. Related craft: In the English Board Solitaire craft project, make the English version of board solitaire and learn more about the history of board solitaire. You can also make French Board Solitaire. 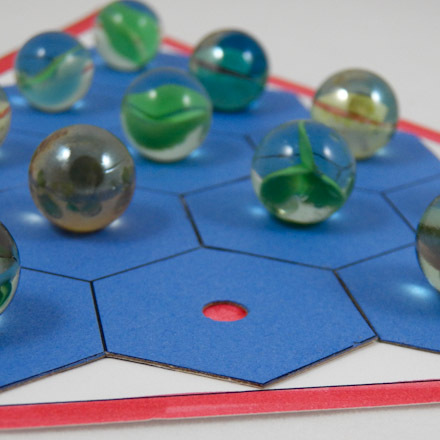 Related craft: Use Homemade Modeling Dough to make your own marble-like game pieces. Choose a Board Solitaire game board to make—colored, black and white, plain, or with designs. Download and print the pattern onto cardstock. Select the black and white pattern and use your creativity to add color and designs. It can also be printed onto colored or patterned cardstock. 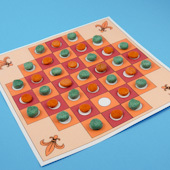 The Marble Tiles patterns are used to make the game board suitable for marble playing pieces. 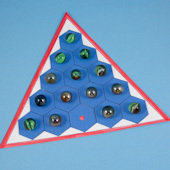 The Triangle-plus game boards have additional spaces and do not have matching marble tiles. Tip: To see a set of moves that results in a perfect game, use the perfect solution printables as a reference. 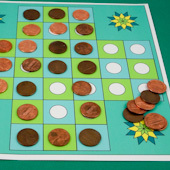 Easy Game Board: The Simple Game Board patterns are for easy "print, cut, and play" game boards. Just follow the instructions in the English Board Solitaire craft project. If you printed the black and white pattern, color the game board with any colors you like. 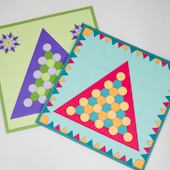 You could color the small triangles with alternating colors—pick two contrasting colors or leave half the squares white. Trim the game board pattern to a triangle shape on the black outline or leave equal borders of white on all sides of the game board. If you have printed on computer paper, you may want to glue the board to cardboard. Skip this step if you printed on cardstock, or if you want to make a paper board. Cut a piece of cardboard a little bigger than the game board. Glue the game board to the cardboard. Cardboard from an empty cereal box works well. Trim away the extra cardboard around the edges of the game board. Tip: Be sure that the glue goes from edge to edge and into the corners. Print the pattern for the Marble Tiles on computer paper. Choose the pattern that goes with your game board. Tip: The Marble Tiles are optional and are for using marbles as playing pieces. If you use flat pieces or coins, the tiles are not needed. If you printed the black and white Marble Tiles pattern on white paper, color the squares with any colors you like, or leave them white. Cut a piece of cardboard big enough for all three tile pieces. Cardboard from an empty cereal box works well. Glue the tiles to the cardboard. Be sure to cover the tile pieces completely, edge-to-edge, with glue. Tip: You can cut apart the three tile pieces to make it easier to fit them on the cardboard. Cut out each of the three tile pieces on the outline. Do not cut out the smaller hexagons. 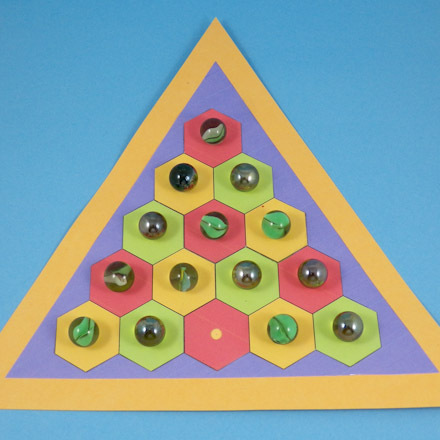 Punch a hole in the center of each hexagon. Use the circle in the center of the hexagon as a guide. Skip this step if you are not using marbles as games pieces. Tip: If the hole punch can't reach to the marked circle, cut on the line between two tiles and slip the punch through the slit. Arrange the tile pieces on the game board before gluing them in place. The tiles will fit together to form a solid surface. 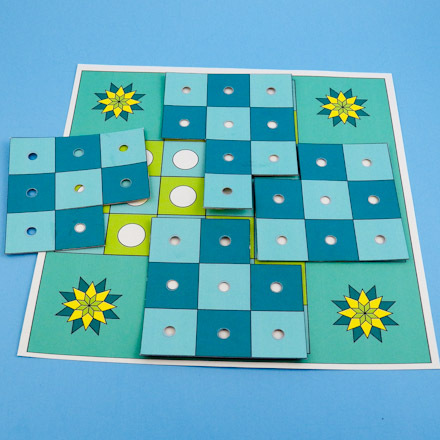 Be sure to center each punched hole over a circle on the game board. Tip: Lightly marking the center of each circle with a pencil will make it easier for you to place the tiles accurately. 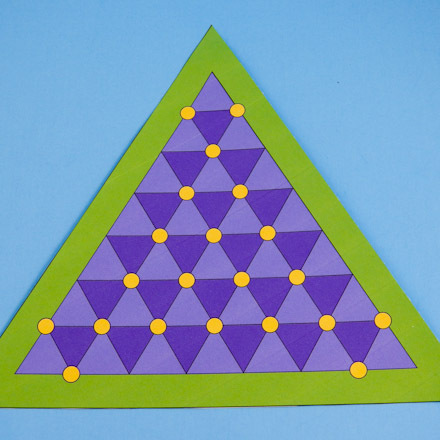 Be sure to arrange the tiles so that there is a different-colored hexagon at each corner of the triangle. 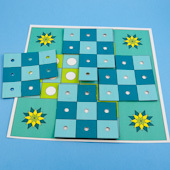 Once you are satisfied with the tile arrangement, carefully glue each tile piece to the game board. Wipe any excess glue from around the tiles and from the holes. Let the glue dry, and you are ready to play solitaire. 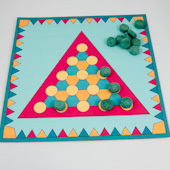 You need 14 marbles (or playing pieces, 20 for Triangle-plus)) to go with the solitaire board. You can make your own marbles with homemade Modeling Dough. The object of the game is to remove as many pieces as you can from the board. A big win is to remove all of the pieces except one. A perfect game is to leave the last piece in the center space that was initially empty. Turn the game board so that the triangle's base is closest to you. Place one marble playing piece in each hole except the center one of the bottom row. For Triangle-plus, leave empty one of the two spaces on the third row. All jumps go over an adjacent piece to an empty space beyond. Start by jumping into an empty space and removing the jumped piece. Continue making jumps, and removing pieces until all possible captures have been made. How many pieces do you have left? Play again to see if you can do better. Take turns playing with a friend, and see who can do best. To see a set of moves that results in a perfect game, use the perfect solution printables as a reference. Start with the piece on the space marked number 1. Jump over the piece indicated by the arrow to the space beyond. Remove the jumped piece from the board. Continue making jumps in numerical order. The last piece will be in the square marked with the star. That's it! You are ready to play solitaire! Tip: The marbles rest in the holes punched in the center of each hexagon tile. Tip: The marble tiles come in three pieces with five hexagons each. 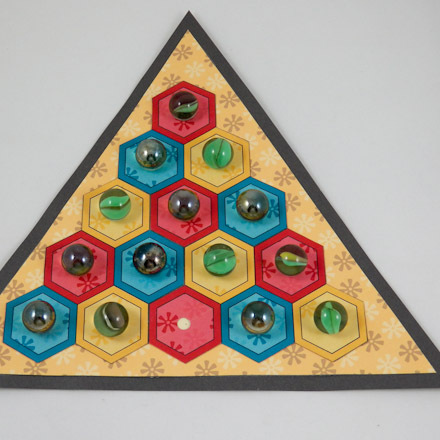 When arranging the tile pieces for gluing, be sure that each point of the board's triangle has a different-colored hexagon. Tip: For a game board with a more finished look, glue the game board to a contrasting color of cardstock or poster board and trim to even borders. Tip: Use Homemade Modeling Dough to make your own marble-like game pieces. For the Simple Game Board make disk-shaped pieces. 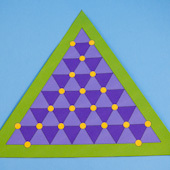 Tip: For another board solitaire variation, make the Triangle-plus game board. Related craft: See how to make and play other versions of board solitaire in the English Board Solitaire craft project. Patterns are included to make a marble version of the game board. Related craft: See the French Board Solitaire craft project for one of the original versions of board solitaire.